Robin Tyler (left) and Diane Olson helped ignite the national marriage movement over a decade ago. 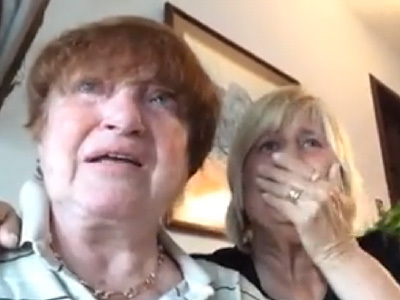 Watch them react to today's historic ruling. Way back in 2004, partners Robin Tyler and Diane Olson were two of the first plaintiffs to file suit against California's ban on marriage equality. Their lawsuit culminated in the state's historic ruling for marriage equality four years later (that was later overturned by Proposition 8, only to be reinstated four years later by the Supreme Court). Both Tyler — a comedian and longtime LGBT activist — and Olson were overcome with emotion upon hearing today's Supreme Court ruling in Obergefell v. Hodges, which brought marriage equality to all 50 states. Check it out below, stay tuned for more reaction, and send your own responses to editor@advocate.com.